There’s nothing quite like the great outdoors. That’s why there are over 77 million American households that camp. Breathing in the fresh air, experiencing nature in its purest form, and spending quality time with the ones you love are just some of the huge reasons why camping is beneficial. Getting off the grid can make a big difference in your life, even if it’s only for a short amount of time. This is especially true for children. Constant technological intervention can impact their health and well-being. Luckily, there are ways to get out into nature and still be able to use necessary technology without having to plug into the grid. We’re talking about solar power! We’re going to discuss how to find the best solar panels for camping and how to get the best deal. Let’s jump right in! 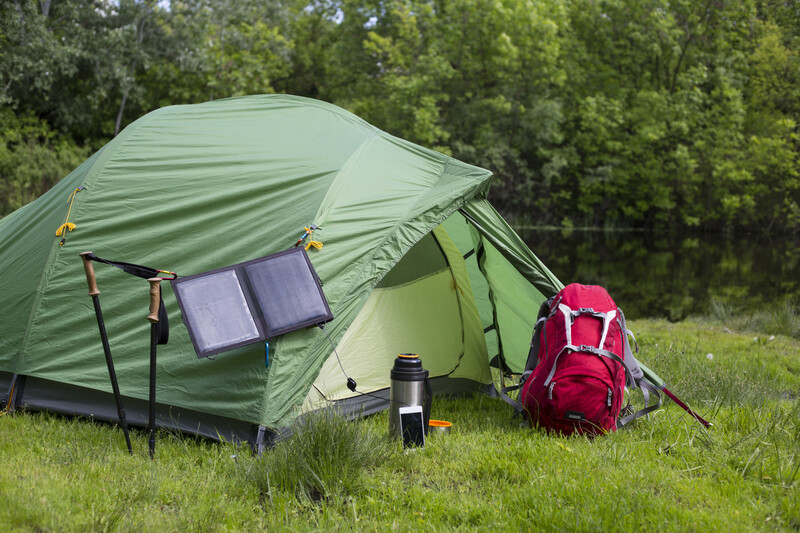 There are plenty of reasons why you can use a solar setup while you’re spending time in the great outdoors. And we aren’t just talking about charging phones… Remember, you want to disconnect from the grided world. Keeping cameras charged- If there’s one electronic device you should be charging, it’s your camera so you can capture all the great moments you spend while in nature. Running a portable fridge/cooler- If you want to spend more time remotely without having to make frequent trips to town to grab ice for your cooler, consider getting a portable solar cooler or fridge. Running appliances- This is especially relevant if you are camping in a camper, trailer, or RV. Most of these come equipt with cooking and storage appliances that require power to run. Heating- If you are going to be camping for a while in a cold climate, you may want to bring a heater with you to get through the night. Keep it charged during the day so you can run it while you sleep. These are just a few uses for solar in the wild, with plenty more depending on you and your situation. Now, let’s talk about how to find the best setup for you. The first thing you are going to need to do is to figure out how much power you will require. This varies significantly person-to-person depending on their situation. If you are going to be powering a trailer or RV for example, you’re going to need to get a larger setup. Especially if you plan on being on the road for longer periods of time. Now, if you are just going to be camping on a few weekends here and there in your tent and you just want to run your speaker and charge your devices, your requirements are much smaller. You can determine your power needs by completing a solar energy audit. The next step is to determine whether or not you are going to be using a portable setup for permanently fixing your panels to a vehicle or trailer. Portable systems come in a variety of sizes and outputs, so even if you are using a trailer, RV, or campervan, you don’t necessarily have to have a fixed system. You can find foldable small panels that are as small as 20 or 50 watts and up to 200 or 300 watts. If you’re looking for a small setup that will charge your phone and your speaker, you would suffice fine with a small 20 or 50w system. When you’re looking for solar panels that are going to be fixed permanently, your options are a bit wider. You can get more rigid larger panels and run them in a parallel system. Most RVs and campers have solar setups between 100 and 400 watts, though you can certainly increase that to 600 watts. 200 watts is usually more than enough to sustain a small camper or RV. What you will want to look at next is whether you want a monocrystalline or polycrystalline solar panel. Either will work great, but there are a few differences between the two to consider. The biggest being the age of the technology. Monocrystalline was the first and used to be the most common among solar users. However, polycrystalline has since taken its place. One of the biggest reasons that someone may opt for a monocrystalline set up over poly is because of its high-efficiency which does often surpass the latter. The biggest reason people stray away, though, is because of its higher price tag. Either one of these would work great for a remote camping scenario. It all depends on how frequently you want to use them, how much you need to get out of them, and how much you’re willing to spend. After you figure out what size panels you need and what kind you are wanting, it’s time to get to thinking about the battery system you will be charging. If you’ve got a batteries equipt in your RV and trailer, you just need to get hooked up to it with the solar. If you are working on a more remote or portable system, then you’ll need to either get a battery system put together or find yourself a solar generator. There are lots of different ways that you can get batteries set up with solar, but it does require a lot of parts to go along with it. The simplest and most portable method to a remote solar setup involves a solar generator. Solar generators are like a battery, inverter, and plug-in all in one. They are usually light, compact, and extremely efficient. If you want to learn more about high-quality and affordable solar generators, check out PoweredPortableSolar.com. Now that you know what it takes to get the best solar panels for camping, you’re ready to get outside and enjoy nature and all it has to offer! There are so many reasons why everyone should try camping. Looking for more great info to get your ready for your next camping trip? Check out our article about the best sites to find gear online. We’ll see you there!